In many ways, Thomas Rain Crowe has had two careers. One he has spent traveling the world, writing and translating poetry. Twenty-five years ago, though, he returned to North Carolina where, with the help of the land outside his door, he has rediscovered the joy of local activism and the beauty of the place in which he was raised. An internationally published and recognized writer, Crowe is the author of more than twenty books, including The Laugharne Poems (published in Wales and written at the home of Dylan Thomas in Laugharne, Wales), his award-winning nature memoir, Zoro's Field: My Life in the Appalachian Woods (Univ. of Georgia Press), two volumes of translations of the 14th century Sufi mystic poet Hafiz (Shambhala), and most recently a collection of short stories A House of Girls (Wind Publications) and a collection of lyrical poems titled Radiogenesis (MSR Publishing). A book of essays, The End of Eden, on activism and the environment is due out in the fall of 2008 by Wind Publications. His poetry and prose resonate with both the love of the land and a deep love for the people who inhabit it. "Thomas Crowe is the embodiment of the bioregional writer," says John Lane, author of Circling Home. "To crib from Basho, he's toured the world and he's tilled his small field to the limit. Knowing he is up there with his hoe in the soil keeps me working." Today, Crowe lives in the Smoky Mountains of North Carolina in the Little Canada community of the Tuckasegee watershed in Jackson County, where he writes poetry, columns and features on local environmental issues, translates poetry, and is part of the fight to protect the land he loves. 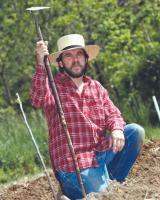 He has been instrumental as a founder, writer and supporter of a number of activist organizations and publications in the region of the Southern Appalachians, such as The Canary Coalition, AMUSE (Artists and Musicians United for a Safe Environment), the Southern Biodiversity Project, WNC Environmental Leadership Council, Green Line, Wild Mountain Times and Smoky Mountain News. Jones: Could you describe a Southern landscape that has had a significant impact on you and your work? Crowe: I can't think of one that doesn't. As someone who was raised as a 'Southerner,' the South is geographically and culturally (which also means linguistically) my place of origin, and therefore the place that I consider home. Specifically, and most obviously, I can cite Graham County, where I grew up, and later Polk County, North Carolina and the watershed that takes in the Green River Gorge near the town of Saluda, which is where my recent nature memoir Zoro's Field is based. The four-year period when I was living in the woods, Thoreau-style, seriously impacted my perspective on life and the environment, as well as my writing style and subject matter. It was this experience that led to my later involvement in the founding of the bioregional publication Katuah Journal: A Bioregional Journal for the Southern Appalachians and various bioregional activities, as well as my work as an environmental activist with any number of organizations and grassroots groups. Living simply and self-sufficiently as I did puts one’s priorities in perspective whereas the natural world is concerned. In that kind of environment and lifestyle, it's important to conserve one's energies on a daily basis, and in doing so one learns the importance of conservation regarding the use and preservation of the environment in which one lives, as well, on a larger scale, as the well-being of the planet. What I’m really saying here is: it's important to live one day at a time. Or, in a more Buddhist context: it's important to live in the moment. If one is doing that, one is more aware of how much energy one expends. And if you are attempting to live somewhat self-sufficiently, as I did during the years when I lived next to Zoro's field, you learn to conserve your energy--in order to get done what needs to be done. It's one of the 'perks,' or I should say: the lessons, that come with the territory, the experience of living alone in the woods. My years living in Polk County, NC were from 1979-1982. Since then, except for a short time in Madison County, I’ve been living in Jackson County, NC--about an hour and a half to the west, and even deeper in the Smoky Mountains of the Blue Ridge. That means that I’ve been living here for almost twenty five years--easily the longest I’ve lived in any one place. That fact, alone, means that I’ve invested a lot of time and energy and focus on this landscape, community, and it's various issues. And, as you would imagine, all this has effected my writing, which includes, these days, a large amount of work that is sent to and that appears in local and regional newspapers, magazines, and other publications and media. Other than what I’ve already cited, here, there are any number of truly exceptionally beautiful, and therefore inspiring, places near and dear to me. In fact, my love affair with this region extends to all of the Smoky Mountain/Blue Ridge/Southern Appalachian chain. Jones: You speak in your article which appeared in the anthology Elemental South titled 'God Willing and the Creek Don’t Rise' of an all out war on the environment in Western North Carolina. I was reminded of Erik Reece, author of Lost Mountain, who said that in order to write about a forest he loved, he had to write about the forces acting on and threatening that forest. My question, here, is two-fold: could you identify what lies at the root of the environmental war here in the western Carolinas and could you identify what is at the heart of your determination to fight and win that war? Crowe: I agree with Erik Reece in that I hold a similar and parallel belief that in order to know what love is, you have to also have experienced love's opposite. The same holds true, I believe, with one's concept of peace. If there had never been a war in human history, we probably wouldn't even have a word like 'peace' in our vocabulary. There would be no basis for it. No need. So, in this sense, Reece is right. If our forests and planetary environment weren't threatened, we wouldn’t need to be writing about these places we so love. As to what is at the center of those forces that we can identify as a threat to our bioregion, our local environment, I think that it's pretty clear that the primary culprit is greed. Greed is a part of human nature, it would seem, at least in those who are unenlightened. And greed coupled with global free-trade capitalism is a deadly cocktail! Just look at how hard the oil magnates (or 'mongers' as I’m fond of calling them) are trying to hold on to the choke-hold they have on the global energy market. They are fixated on getting every last drop of crude oil out of the earth's interior and, thusly, getting every last dime of profit possible from those of us who are at their mercy. While European nations (such as Germany and Norway, for example) are successfully investing in alternative and sustainable sources of energy (wind, solar, low-tech hydro, bio-fuels, etc.) the U.S. is doing everything it can to keep us dependent upon destructive oil and fossil fuel energy sources. To the extent that they won't even talk about such things as 'alternative energy,' global warming, and the like. This dynamic also trickles down and plays out on the regional and local level, as well. Right here in western North Carolina, we've got some of the worst air pollution (during certain times of the year) of anywhere in the country. This is an air quality issue. The coal industries and coal-fired energy plants, etc. are the primary cause of this pollution, and the government (both state and federal) are allowing these businesses to continue to operate without restrictions. And in fact are approving licenses for the construction of new coal-fired energy facilities in western North Carolina. It’s all about the bottom line. Money. And greed is fueling (excuse the pun) this. I helped to create a grassroots organization to address this issue. We call it the Canary Coalition. It's a watchdog organization that tries to hold energy companies and other polluters to task for their noncompliance with what regulations do exist, as well as to lobby for stricter and much needed additional regulations. Here in the mountains we also have a 'gold rush' kind of problem with the real estate and housing development markets. There's a land-grab mentality that has become epidemic in the last ten-fifteen years, and here in Jackson County it feels to those of us who are year-round residents, as if we've been invaded. Invaded by out-of-state mega-developers (such as Centex from Texas), who have come into the mountains and are buying up every square inch of land that is available and building huge acreage gated communities filled with McMansions. What this is doing to my neighborhood is not only creating a visual blight on the landscape, but it is destroying our way of life. With the high-priced land and the values of these million dollar mansions, the tax values on local homes and land go up exponentially, to the point where natives and locals can no longer afford to pay the taxes on their properties and are forced off the land. This paradigm is all calculated by the developers. And there is precedence for this kind of thing in the kinds of housing developments and the resulting scenarios that have played out across the country in various locations in recent years. Even closer, yet, to home, there's the imminent threat of a gravel-crushing operation that a Florida developer wants to put in literally right next door to where I live. What do you think that a rock quarry would do to the quality of life where I now live? I’ll tell you what it would do. It would force me to have to move. And that's just what these developers, these 'greedy capitalists' want. So, we're fighting for our lives here in Tuckasegee. This is a pretty strong incentive in terms of identifying what is at the heart of my desire and determination to fight for what we've got. In this particular case, they've under-estimated the firepower and determination of our rural community. And we've stood up to them, organized, and done our homework, and have successfully, we believe, stopped them from bringing a rock quarry into the heart of our community. Not only has my work been to 'stand in front of the bulldozers' so to speak, but we've got a lot done using the pen as a weapon against the onslaught of unchecked development here in Western North Carolina. A well-placed and well-written article or letter has often been the catalyst to mustering the troops. And has certainly been a source of education to those of us who aren't as plugged in to what's going on as we might be. So, in this sense, the pen is mightier than the sword. And on some small, and some not-so-small, fronts we're winning some important battles. If, on the other hand, they were to put a rock quarry here in Tuckasegee, I'd have to leave. And to leave this place would mean leaving a part of me behind, as I’ve invested a lot of my blood, sweat and tears, here in this valley in the last fifteen years. Of course, I don't want to move, and hopefully will not have to. But if they should put a rock quarry next door, this place would no longer be habitable--with the air pollution (dust), the noise, the traffic on the road in front of the house, etc. Not to mention how devastating the whole thing would be on the eyes. Jones: Your short essay, 'You Are What You Eat' is one of my favorites. The girl in the piece enchanted me with her love of blackberries, her curiosity and her enthusiasm for all tasks—selling blackberries, imagining she is a blackberry, running off to play fiddle when the berries are gone. She reminded me, in her joyful versatility, of both Emerson and Wendell Berry’s call for us to be more than mere specialists. Crowe: There's something to be said for being good at what you do and for being an 'expert.' On the other hand, I agree with Emerson and Wendell Berry, who are two good examples of people who have become stewards of nature and are more than 'one trick ponies' in terms of living simply, sustainably and as practicing conservationists. Both of these men have had a huge influence on my life and work. I am currently reading Wendell Berry's new book of essays The Way of Ignorance. These are wonderful musings on subjects relating to sustainability, right living, responsibility, 'good and bad politics', etc. I highly recommend this book for anyone who would want to find inspiration in terms of being an activist-writer. Jones: I was also struck with how human 'You Are What You Eat' is. I mean, I think there is a misperception about nature writing--that it is all about landscapes and political issues. In a way, my first question about landscapes is probably infused with that very bias. Nature writing is, it seems, ultimately about nature and that also includes humankind. Drawing a distinction between the two—humans and the natural world—is at the root of the environmental problems we face. Crowe: I agree, completely. 'Nature' is a very large and all-encompassing subject, which does, indeed, include the human as well as the wild. Both are part of the same over-riding paradigm. One could even include the entire universe, as Thomas Berry does in his writing, bringing cosmic and spiritual elements into the mix. Yes, any kind of separation or segregation regarding one's perception of 'the whole' is a mistaken perception of reality. Everything is a part of everything else. Everything is connected and interdependent. And in that sense, everything is sacred. Jones: In terms of your work as an activist and a writer, can you tell me a little bit about any specific articles or letters that have effected positive change? Perhaps, too, could you tell me a little about articles or letters that have not worked or that have garnered hostile responses? Crowe: I could share several examples of this sort of thing. The first real eye-opener for me came after writing an editorial titled 'The End of Eden' for a local newspaper. In this article, I describe what things will look like in the future if we let these mega-developers come into our community and have their way with it. This was something of a wake-up call for some, and for others I think it expressed what they had been thinking, too. I got a lot of feedback on the street from people thanking me for writing that piece. My article generated a wave of interest in this issue and people began writing letters to the editor, Op. Ed. pieces, etc. And, I think it got people thinking about and engaged in local politics and the importance of the local elections that year. I followed 'The End of Eden' up with an article in the newspaper here in Jackson County about how there were three candidates running for the Board of Commissioners [BOC]--all of whom were employed by the same out-of-state developer who was building a gated community. In essence, trying to 'stack the deck' (which was the title of my article) on the BOC in favor of development and against any sort of land-use planning in the county. Again, I let the cat out of the bag with this one, as people hadn't made the connection between the candidates and the developments. Many people thanked me for informing them of this fact. And in the end, none of the development candidates were elected to office in the county elections and the following year the BOC passed the strictest land-use regulations in the state of North Carolina. And, now, other surrounding counties are following in the footsteps of what we have done here in Jackson County. A third example would be a follow-up Letter to the Editor that I wrote--letting people know that the county had issued an ordinance to give the top two vote-getters in the mid-term elections a four-year seat on the county Board of Commissioners. The other two candidates [were] only getting a two-year seat on the board. This was a well-kept secret and a political ploy in terms of getting the 'right' people on the board for a four-year term. My letter, again, informed the public, and the two progressive, pro-land use planning candidates got the most votes in the elections, giving them more time to implement their ideas regarding putting some much-needed zoning regulations in place. There are other examples as to how my editorials and articles have impacted the community. Suffice it to say that one person's voice can make a difference. I offer up my stories, here, solely as a means of encouraging others to do the same. I wonder if this, too, has something to do with the fact that we, as a society, have become so accepting of hypocrisy, that when we encounter someone who is genuine we either think they are crazy or that they must be lying. Crowe: I think your assessment of why Wendell isn't more well known (and Thomas Berry, too, for that matter) has a lot to do with the 'sheep' mentality of the American culture, as well as the general public's willingness to accept hypocrisy and lies. And I think you may be right when you say that people are so used to being lied to, that when they hear someone who speaks the truth, it's unsettling, even suspicious. A sad commentary on our times, and the collective state of mind in this country. Also, I think Wendell is perceived as a 'regional writer'--which is a blessing, on the one hand, and a curse, on the other. His writing is very place-specific (as he says over and over in his latest book The Way of Ignorance), yet it's appeal should be much more wide-ranging than just for folks who live in Kentucky. His message is really global in its profundity and understanding of sustainable systems, thinking, and economics. And [Terry Kay] may be right, that he's the U.S.'s best chance at a Nobel. Even so, I don't look for that to happen, simply because he's not known, as you point out, in wider literary and political circles. In any case, he's one of the most profound (and accessible) writers we have writing on the subject of agriculture, community, right living, sustainability, etc. Jones: It seems to me that 'regional' for some folks, is a euphemism for 'easily dismissible'. After years abroad, translating, writing and making a name for yourself as a so-called 'Baby Beat', have you made the conscious decision to become a regional writer--to act locally, write locally, live locally? Crowe: I’ve never considered myself a 'regional' writer. My interests and influences are too diverse and far-reaching for someone to hang that label on me. And I would certainly never hang it on myself, as I really don't like labels or being boxed. I’m a curious person and my attention span, so to speak, is rather short. Hence the extreme fluctuations and variations on the theme of my literary career. At the same time, I’ve invested a lot of literary (as well as physical) time and energy into this place where I live. I suppose you could say that I took the bioregional ethic of 'thinking globally and acting locally' to heart. After all, I was on the west coast and quite literally right in the middle of the beginnings of the Bioregional Movement, and was active in that movement. My regional loyalties and my activist behavior since the 1970s probably reflects the influence of my years hanging around people like Gary Snyder, Peter Berg, Lee Swenson, and others. It was during these years that I also met Wendell Berry, who is a friend of Snyder's. Wendell's work up in Kentucky with his community has been something of a model for me in terms of the kinds of things I’ve been involved with here in the Smoky Mountains of the southern Appalachians. If you look only at what I’ve produced in the last twenty-five years as a writer-- that has to do with my region (or the Katuah bioregion as we call it)-- it is substantial in terms of quantity, and therefore one could make a case for Thomas Rain Crowe as a regional writer, a Southern writer, etc. But there is really too much other kinds of work, published and unpublished, for one to reasonably hang the 'regional' label on me. I write for local newspapers and publications because there are environmental and cultural issues here in the North Carolina mountains that need to be addressed. I do it partly out of a sense of self-preservation and survival, and also out of a sense of duty, as I feel that it is a writer's obligation to be participatory in his community and his culture. It's part of the job. At least, this is what I believe--which comes in large part from my connection with the Beats and the whole Beat ethic, as it were. And hanging around Gary (Snyder) certainly reinforced those sentiments and that code of literary ethics. The fact that I can live the kind of life I do and be identified in my community as a writer is indeed a blessing. It's not an easy life, economically, but I have found ways to live simply and yet richly here in the rural South. This is where I grew up, and so even though I’ve wandered and traveled a good deal during the course of my life, it is still home. The down side to all this, if there is a down side, is that it is difficult for any writer to find publication for his work. We don't live in a reading culture and so the audience is a small one and there is plenty of competition for the many (too many?) writers to find publishers for their work. So that part is a bit of a struggle. But otherwise, it's lovely being recognized and acknowledged in your own home for what you do. In that sense, Thomas Wolfe was wrong in saying that 'you can't go home again'. I’ve come back home, and it's worked for me! And, in the end, I’ve found that a writer's best audience is a local one. There is more gratification in having a dialog with folks that live around you and who have faces and names, than a disembodied national audience. I think even writers of blockbuster books such as Charles Frazier, whom I know, would agree to this. Jones: What kind of impact, exactly, did Snyder have on your writing and your life? Crowe: I’d have to say that he has had more of an impact on my life than my writing, although his essays have been important for me, I think, and my own eventual attempts at writing in that genre. Spending as much time as I did living and working with and around Gary Snyder as I did in Northern California in the 1970s, a lot of his bioregional ethic, his Zen Buddhism, his poetics rubbed off on me. In some ways quite literally. It was he, for instance, who suggested that I come back to North Carolina to spread the bioregional message--which is what I did, eventually, in December of 1978. Snyder led by example. There were many in those years who have gone on to do interesting and important things that were nurtured by their apprenticeships with Snyder. In many ways, it was Gary who really caused me to begin focusing on the importance of environmental preservation, sustainability, simple living and the like. And to make those subjects themes in my own writing. He is a very focused man and his focus on nature and wilderness really turned my head, as I had been living a rather deranged life in San Francisco, France and other urban settings. Living for the time I did up on the North San Juan Ridge in the Sierra foothills of Nevada County, California, was a turning point in my life. And I’ve been living a rural and semi-sustainable life ever since. Nature and the preservation thereof has been and is at the center of almost everything I do these days, as I think that this is the most important issue of the 21st century. And this way of living, this way of thinking, all began with my association with Gary Snyder. And I will forever be beholden. On the other hand, I’d have to say, quite honestly, that I’ve never been a big fan of Snyder's poetry. Not that I don't like it, but that it's not really had the kind of influence on my own poetry as other of his Beat comrades have--such as Ferlinghetti, Kerouac, Kaufman, and Hirschman. His poetic style is a bit spare for me. In that sense, he writes more in the style of the Black Mountain Poets than the Beats--which, of course, is a bit ironic, since he is one of the most famous of the Beat generation poets. His major influence on me has been his work as a scholar and essayist. Much of my own prose writing the past twenty-five years or more has been a direct result of my time in Northern California and working with folks during the early years of the Bioregional Movement. And Gary, of course, was at the center of all that. His book Practice of the Wild is a cornerstone book for me, and there are several references to that book in my own book Zoro's Field, as well as in many articles, essays and editorials, I’ve written over the years. Jones: What kind, if any, of direct influence has Snyder’s practice of Zen Buddhism had on you? Crowe: Not a lot, probably. I had been interested and looked into Zen Buddhism, Taoism and such during my college years. I found that I liked certain aspects of the Buddhist aesthetic, but the rather harsh disciplinary aspects of the religion left me cold. But I watched closely, during my years along the North San Juan Ridge, as Gary practiced his sitting and meditation in a regular kind of way, and was impressed by his enthusiasm for Zen as well as his strict discipline. I think I learned as much about discipline and commitment from Gary's Zen practice as I did in earlier years in San Francisco from observing Jack Hirschman's dedication and focus with regard to the writing and translating of poetry. Both these men had admirable work ethics. Being someone who really didn't like discipline and had no observable work ethic, being around them helped me to develop a work ethic in later years that has helped keep me in food and shelter as a writer. These days—twenty-five years later--I’ve gotten into Zen gardens and landscaping in a big way. But I don't really think that there is any direct connection between this recent interest of mine and my earlier contact with Gary. Jones: What is your poetic philosophy? What should a poem be? What should it do? How should it impact the reader? Crowe: You might think that what I am going to say, here, will sound evasive, even a bit lame, but I don’t think that I can give you any good answers to any of the questions you’ve posed. I don’t think you can answer, definitively, what a poem should be, what a poem should do, how it should impact the reader. Every poet has his/her own process and objectives when writing. Each individual poet has his/her own notions of whom their readership is and what they want to convey to those readers. In most cases, however, I think that most poets would admit that they don't write for any particular readership or audience, and because the poet, himself, may not know what his poem is about, he cannot know, then, what the poem should do, be, or even be about. Poets don't usually have these kinds of expectations, I don't think. At least, not poets who are worth their salt. If there is an answer to the question 'how should a poem impact a reader?' it might be, simply, that the reader should enjoy it. Or learn something. Feel something profound. I think all poets hope that what they are writing will have such effects on those who read their poems. As for what the poet may get out of this process, he/she should enjoy the ride, as it were. Trust and enjoy the process. And on the other end, be satisfied with the result, in the sense that they knows that they have given it their 'best shot,' as Gregory Corso was so fond of saying. While I don't subscribe to any particular poetic philosophy, I do subscribe to Kerouac's idea of 'first thought, best thought.' Kerouac trusted his intuition and impulses and it served him well. I am, I suppose, of this school. This being the case, I tend to think that it is the green fuse that drives the flower, as Dylan Thomas said. That said, I should also say that one should try and make their poems as good as possible, in terms of craft, without editing the soul out of that 'first and original thought.' These, very simply, are my poetics. My rules of thumb. But, there are as many different poets as there are styles and perspectives. The same can be said of readers. This being the case, how, then, can we have hard and fast rules for how to write poetry and what is good and bad poetry? It's all so very subjective.